Most often the ventilated facades have composite panel ( Etalbond ).Etalbond is a composite material type sandwich, which consists of polyethylene base, bilaterally agglutinated with fine aluminium sheets on both sides. The connection between the aluminium sheets and the base is realized through simultaneous application of mechanical and chemical methods in conditions of high temperature. The result is robust and very stable composite material sheet with total thickness between 2 and 6 mm. In addition to its stability and easy assembly, Etalbond® is very attractive for architects and designers because of its vast range of offered colours. In addition to all colours in the RAL catalogue, Etalbond® is offered in chameleon colour (changes its colour according to the angle), wood imitation, marble and stone. 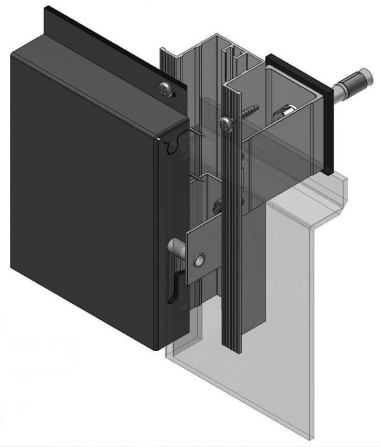 -ensures opportunity for linear widening for ventilated facades without visible gap etc.